Everything is always moving and changing. The cycles of life, day and night, seasons …flows from one to the other. One of the reasons they say opposites attract is based in the Yin & Yang theory. Opposites complement one another with their differences. The dictionary defines Yin and Yang as: two complementary principles of Chinese philosophy: “Yin is negative, dark and feminine. Yang is positive, bright and masculine. Their interaction is thought to maintain the harmony of the universe and to influence everything within it”. Now this is quite different from what we are taught in the west … we are taught that negative and dark is masculine and positive and bright are feminine. This just points out the difference between the east and the west. 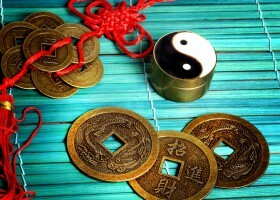 For feng shui purposes you will always use the eastern philosophy. Your balance, harmony and feng shui well being is directly correlated to how the yin and yang are represented throughout your home. It should always try to be as balanced as possible and still honor the use of the space. Your bedroom is for rest and relaxation, so the yin presence will be stronger but you will still need to bring in some yang to balance things out. Honoring your personal pull towards balance, yin or yang is essential to take into consideration when creating your surroundings. While most people will lean toward a balance of both yin and yang, there are some that prefer leaning towards the yin (dark and cave like) as well as those which prefer the yang (bright and sunny). It is important to honor your own personal style and feelings about how you feel in an environment. I like it bright and sunny myself and find the need to bring in some anchors to the spaces to balance it out, and still it will lean towards the yang. That is my personal preference and makes me feel like I can tackle anything. When I take on a client it is important that your preferences are honored, nurtured and taken into account when I make my recommendations. Since much of feng shui is how you feel in your space, I will guide you to find just the right balance of yin and yang that makes your heart soar.